MOSCOW, Russia -- With Ukraine set to sign a free trade pact with the European Union on Friday, Russia has said it is likely to respond with trade barriers without seeking approval from Belarus and Kazakhstan, its partners in the Customs Union. 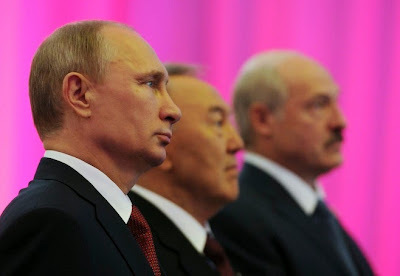 Russian President Vladimir Putin (L), Kazakh President Nursultan Nazarbayev (C) and Belarus President Alexander Lukashenko stand for a photograph before a meeting of the Eurasian Economic Union in Astana, Kazakhstan. Ukraine is due to sign the second part of its association agreement with the EU on June 27. The pact has been at the heart of the conflict between Russia and Ukraine since last year, when Moscow put pressure on Kiev to shun the EU in favor of joining its own Eurasian Economic Union. Ukraine's Moscow-backed president Viktor Yanukovych agreed to do so and triggered an uprising that led in February to his own overthrow, swiftly followed by Russia's annexation of Crimea and a pro-Russian separatist rebellion in eastern Ukraine. "We have a possibility of imposing customs-tariff measures at the level of the Russian government," First Deputy Prime Minister Igor Shuvalov was quoted by Interfax as telling reporters in Russia's Black Sea resort of Sochi earlier this week. Moscow fears that an influx of EU products into Ukraine will lead it to dump some of its own production in Russia. It is also concerned that Ukraine may re-export EU products into Russia, avoiding duties that Russia imposes to protect its own output. Customs duties in Russia would put at risk some of Ukraine's exports, which mainly consist of base metals, grains, machinery, equipment and processed food. Ukraine sends 24 percent of its exports to Russia, worth $15 billion a year. Shuvalov did not say what kind of trade barriers were likely to be imposed, but said the move would not require approval from Belarus or Kazakhstan, raising the prospect that these could potentially re-export Ukrainian goods to Russia duty-free within the Eurasian Union. Officials in Belarus and Kazakhstan were not immediately available for comment. Russian steelmakers and dairy producers have been among those lobbying for protection once Ukraine's free trade agreement with the EU comes into force. Russia's agricultural inspection agency, the Federal Veterinary and Phytosanitary Inspection Service, has said it is prepared to toughen the requirements for Ukrainian imports. Although many Russian firms make heavy use of imported supplies from Ukraine, Russian President Vladimir Putin told an agriculture meeting in the southern city of Stavropol last week it was "absolutely certain" that Russia would not be able to maintain its zero duty on imports from Ukraine. In an attempt to allay some of Russia's fears, the EU agreed last week to hold high-level talks with Moscow on the implementation of the agreement, something it had previously rejected. "If there is concern, we are ready to conduct effective consultations further." The EU will also sign association agreements on Friday with two other former Soviet republics, Georgia and Moldova. Belarus is Russia's closest ally, relying on Moscow for cheap energy and serving as a buffer zone between Russia and NATO nations. However, Belarus' President Alexander Lukashenko has criticized referendums staged by pro-Russian separatists in Ukraine and has warned Moscow not to take any more ex-Soviet territory after annexing Crimea. Kazakhstan President Nursultan Nazarbayev, the second largest post-Soviet economy after Russia, told Putin in March he "understood" the logic of Moscow's actions in Ukraine. In a sign that the crisis in East-West relations over Ukraine could be easing, Putin asked Russia's upper house on Tuesday to revoke the right it had granted him to order a military intervention in defense of Ukraine's Russian speakers.